Here follows two stories of two lives. Take some time to compare the two and decide for yourself, which is a better life. She has a teenage daughter who hates her at the moment and is not ashamed to show it! Each day is filled with the painful reminder that her daughter is no longer a little girl but a woman who is finding her own feet in this nasty world. At times it causes quite a strain on her marriage and most days she feels helpless and lost in the battle. She cries out regularly to God that her daughter will come back home to Him so that the family can be at peace again. Life in general is quite challenging as money is tight most of the time as she chose to stay home and raise the children and not go out to work. Her husband battles between running his own business and serving as a pastor at church. She doesn’t really know how he copes with working amidst a buzzing home life. Each day they do their best to make something of their life and hope that one day God will do something big, something that will bring breakthrough into all the areas that they struggle with. Her clothes are mostly hand-me-downs, second hand items that she has been given and she lives in a home in an area that is considered by some as quite rough. There was a time, many years ago, when the street that she lived in was considered so dangerous that parents would not allow their children to walk down it. Although the houses were quite large they were also very old as they were built during the war time in the 40’s which meant that there were many repairs to be carried out on a constant basis. Days seem so long and so busy, often leaving them tired at the end of the day. Holidays are few and far between and hard work is a constant part of their reality. They strive and struggle and fight through most days only to wake up and do it all over again. Seldom do they experience great miraculous breakthroughs for all their hard work. It seems that life can be hard, one long struggle. She has four gorgeous children who are growing up in a Christian home and she counts it a real privilege to coach them in the things of God. Each child has something special inside of them and each day offers an opportunity to get to know who God made them to be. Parenting is like building a beautiful jigsaw puzzle, each day finding a new piece that fits nicely into place. Life is an adventure, with each and every day offering opportunities to see God’s grace and provision. He is so wonderful and provides so perfectly each and every day. Her husband is in the fortunate position of working from home which means he can spend extra time with the children, a privilege that many fathers do not have. Together they embrace the adventures of their life and give thanks to God for all the amazing opportunities He has given them. Each day they tackle the challenges of life with confidence that each small step forward counts towards the big dream that they carry in their hearts. Expensive clothes are not a priority to her but somehow she has ended up with a really lovely wardrobe with many designer labels made of wools, cottons, leathers and other such gorgeous fabrics. God has truly blessed her with friends who have kindly shared their blessings with her and given her such lovely items. There is of course also TK Maxs which helped her wardrobe along nicely too! For someone with so little income she is certainly blessed with such lovely things. Not only are her clothes lovely but so is her home and landscaped garden. Together they loved spending their free time restoring their beautiful old home, bringing hidden wooden floors to life and uncovering original wood burning fireplaces. Their home was warm, beautiful and very comfortable for their family of six with gorgeous views of the surrounding Cotswold Hills. Days are always full and satisfying and often they fall asleep thanking God for all the amazing people in their lives. They love to work hard and live for a purpose. Something extraordinary. Something bigger than themselves. Something that will leave a legacy for their children. Each day they aggressively take one more step forward towards building this ‘something’ that is larger than life. It seems she has all that a girl could wish for. Which of the above two lives would you chose, which one sounds best to you? Would you prefer to live, Life One or Life Two? Which family life sounds better to you? Which woman seems happier? Answer honestly before reading on. Now let me tell you a little secret! Both lives are one and the same. Each detail is one hundred percent accurate and truthful. Both stories contain facts but each story is written from a different perspective. Story one focuses on the hardships and the struggles, story two focuses on the positives. Every single one of us has a story to tell and each of us has a long list of both positives and negatives. Your perspective will determine how much you enjoy your life and your enjoyment will determine whether you end every day satisfied or exhausted. You can do everything in this book, executed perfectly, and still end up drained and tired! There is one final key that will set you free and that is to give thanks in everything. Read the two stories again and see how each area could be either a positive or a negative. For example, she could see her clothes either as second hand or as designer clothes that she was able to wear and could never afford to buy new. The second hand clothes could be seen as a negative or as a real blessing – the power was in her choice. The fact is that they are second hand but her decision to give thanks rather than complain about them was her choice entirely. I am sure she would rather wear quality second hand clothes than super cheap clothes that did not fit well, had a poor cut and wore out within a couple of months. Another example could be the tiredness. The fact is that most days she went to bed exhausted but what you can’t tell from the two stories was that whilst she did in fact often fall asleep from exhaustion. It was with a huge smile on her face as she was exhausted from having a full day of good things. She did not fall asleep complaining about her tiredness but rather she fell asleep thanking God for all the things that she got to do each day. How do you fall asleep, do you complain about a sore back from all the hard work or do you thank God for all the hard work that you had the privilege of doing? The power is in your choice, you will always lean towards one or the other, towards complaining or giving thanks. You are either a glass half empty or a glass half full person, there is no in between ever. Restoring your soul can be achieved very simply by giving thanks in all things. Complaining is draining but gratitude is the best attitude. No matter what happens each day, there is always a good angle to it and a bad angle. No matter what your life looks like there is always someone worse off than you and someone better off. If the grass looks greener on the other side, turn on the hosepipe and water your own lawn! This is a chapter snippet from He Restores My Soul. 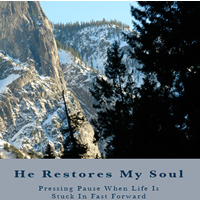 Find out more about giving thanks in He Restores My Soul. I choose to give thanks Angela, I would not want to end up like those who could not enter the promised land because they murmured against God. Thanks for reminding us of this important virtue. Following you now on NETWORKEDBLOGS.